The monument was erected to commemorate the 70 Australian men and women who took part in the Spanish Civil War from 1936 to 1939. 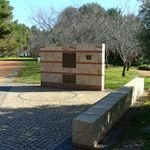 The memorial is a wall of sandstone blocks with red brick courses. There is a low sandstone and brick parapet on its north east side. 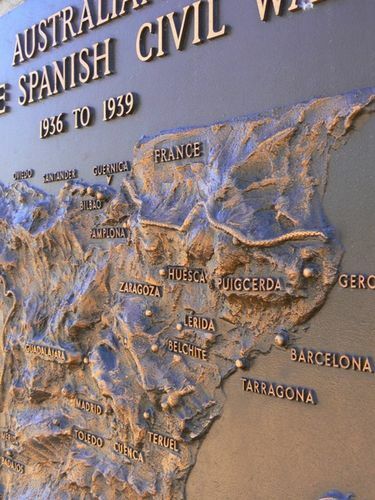 On the wall is a bronze plaque above a bas relief map of the Iberian peninsular showing towns where major battles took place during the war. The bronze map and its associated text was created by Dr Ross Bastiaan who has placed a number of similar plaques in Australia and other countries commemorating Australian military endeavours. Below this is a plaque with a description in both Spanish and English. There is another small plaque on the upper right of the wall in memory of the maker of the memorial, Netta Burns. The memorial was instigated by a group wanting to commemorate Australians' participation in the Spanish Civil War. The Australian War Memorial could not accommodate them as the men and women who went to support the republican cause were not 'Australian forces'. The Australian Capital Territory government assisted them to place the monument by Lake Burley Griffin and it was unveiled in 1993 by Lloyd Edmunds, one of the last surviving Australian members of the International Brigades. The inscription states that the 70 Australians served with the Republican Government forces. This is incorrect, in that 69 Australians did serve with the Republic Government forces, but Mr Nugent Bull served with General Franco`s Nationalist forces. This monument honours the seventy Australian men and women who went to Spain during the Spanish civil war of 1936-39 to defend the cause of the Spanish Republic. A Republican Government was elected in Spain in 1931 and a democratic constitution promulgated. In July 1936 a group of Spanish generals led by Francisco Franco staged a military uprising against the Popular Front Government precipitating a bloody civil war. When the conflict ended in April 1939 General Franco`s Nationalist forces controlled the country. During the civil war some 50,000 supporters from fifty-three different countries went to Spain to defend the Republic. For them the Spanish Civil War represented the first battle in a larger war against fascism. The Australian writer Nettie Palmer who was in Barcelona when the uprising occurred said of those who supported the Spanish Republic - though they were few in number and not powerful and seemed often to be shouting against the wind theirs was truly a brave chapter in Australia`s history. This memorial erected by the Australians in Spain Memorial Committee was dedicated on 11 December 1993 by Lloyd Edmonds, International Brigade veteran.